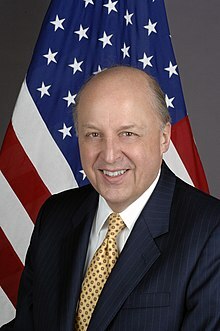 John Dimitri Negroponte (/ˌnɛɡroʊˈpɒnti/; born July 21, 1939) is a British-born American diplomat of Greek descent. He served as a research fellow and lecturer in international affairs at Yale University's Jackson Institute for Global Affairs, United States Deputy Secretary of State, and the first ever Director of National Intelligence. ↑ "Ambassador John D. Negroponte: Briefing a Future President about Foreign Policy | GW Today | The George Washington University". Gwtoday.gwu.edu. 2016-02-24. Retrieved 2016-08-18.